Bay Haven Inn of Cape Charles invites all of you writers out there to join us here on Virginia’s Eastern Shore for one fun workshop! Are you in need of a quiet place to collect your thoughts and sort them out onto paper? Do you have a half-finished story that you just haven’t found the time to complete? Do you find yourself struggling through writer’s block and in need of some brainstorming? Then this workshop is definitely for you. Keep reading to find out more information about workshop activities, registration, and our phenomenal writing coach, M. Shannon Hernandez. 1. Your workshop activities will include the following: individual instructional sessions with Shannon, sunrise journaling, a sunset celebration, wine tasting, two writing craft workshops, a writer’s meet & greet, and plenty of time to write on your own and hone your craft. 2. If you choose to sign up for the “Bayside Escape” option, breakfast will be included! 5. 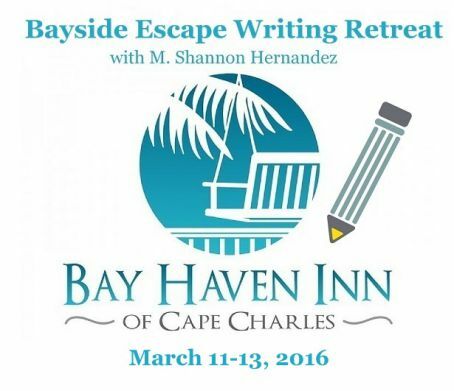 The last day to register for the Bayside Writing Retreat is Friday, February 19, 2016. Space is limited, so be sure to grab your spot today! Whether you choose to write on our wrap-around porch, in the winter beauty of the gardens, by the crackling fireplace, or along the shoreline, you’re sure to enjoy the experience. Please feel free to call us (757) 331-2838) or email us (info@bayhaveninnbnb.com) with any question. We look forward to seeing you at this relaxing retreat!